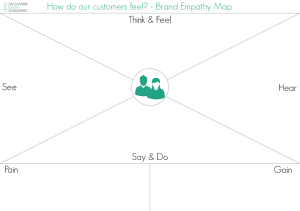 One of the first things we do when we talk “branding” with our clients is ask them to fill out a basic Empathy Map. What is an Empathy Map, you say? Empathy Maps are something that have floated around business since the mid-90s, after being pioneered by Dave Gray and XPLANE consulting. Undoubtedly you may have been forced to do one of these on a corporate retreat, or as a team-building exercise. The concept is simple; crawl inside the mind of your key customers and understand what makes them tick. Well, Empathy Maps have made a stealth comeback lately in the online marketing world. Re-branded as “Buyer Personas”, content marketing behemoth Hubspot is one of the big forces behind bringing empathy back. As marketing returns towards being more personal and engaging, understanding your potential customers has never been more important. We all get tunnel vision when it comes to our business, but by taking a moment and getting into the mind of our customers, we can be on the outside looking in. This allows us to see the business in a new light, warts and all. It stops you viewing your customers as entries in a CRM or balance sheet and starts you thinking about how you can better meet their needs, which will inevitably benefit your business. 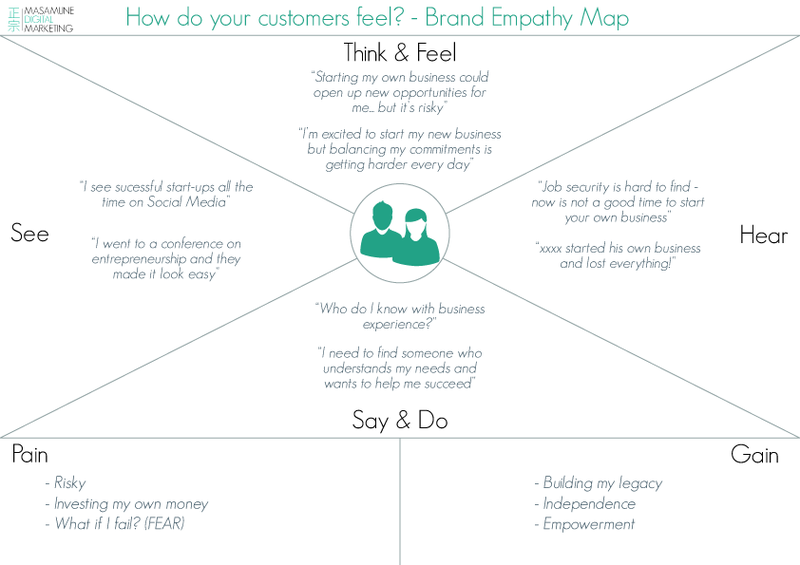 To get you started on your journey of customer discovery we’ve provided you with an example empathy map, and a blank one that you can fill out and apply to your own business. In our example we’ve gone pretty broad and chosen someone who is starting their own business, as a lot of us are already in that boat or thinking about going down that road. Now, while looking at the example provided, imagine that you are a company specializing in business advice and accounting for start-ups (a lucrative job in this market!). Reading the empathy map, you’ve established a few key things that need to be communicated in your marketing. Your business needs to instill confidence – you need a brand that looks well-established and knowledgeable… But since your clients are start-ups, it also has to look approachable and affordable. You need to reinforce the positive images they’ve seen (other people being successful, etc.) address their concerns, and adjust their expectations. Create an image of authority through regular blog posts on topics relevant to start-ups. When thinking about your overall brand, choose a colour palette that people associate with authority (darker shades, greys, navy blue) and offset it with more gentle imagery and fonts. Alternatively, go the other way and have authoritative imagery and fonts, and offset them with more approachable colours (pastels, lighter blues, earth tones, yellow). Leverage the fact that your customer has “seen” successful people but may not understand what went into their success. Provide case studies on how other people have become successful entrepreneurs (and here’s the key) using your services though case studies & testimonials. There you have it – a quick, foundation look at empathy maps and how they can help inform your marketing strategy. Finished your Empathy Map and come up with some great ideas to invigorate your marketing? We’d love to see it and work with you on bringing it to life. Contact Us.